The three wise men didn’t arrive bearing a Quadcopter, a Nerf Gun and a Nintendo Switch. And they’ll certainly not be buying them from us because we’ll be closed from Dec 22 and returning on Jan 3, 2018. All orders placed during this time will ship on Jan 3. This newsletter I give you the gift of the recipe for my favourite caramelized pear tart and a suggestion if you are struggling for a last minute gift idea. That’s it! Peace, hugs and love. As so many of you know my travels in India have changed me forever. You know how much I love and hold dear the work that the Maiwa Foundation does in India for textile artisans. One of my favourite projects is the Pink Bike Donation. 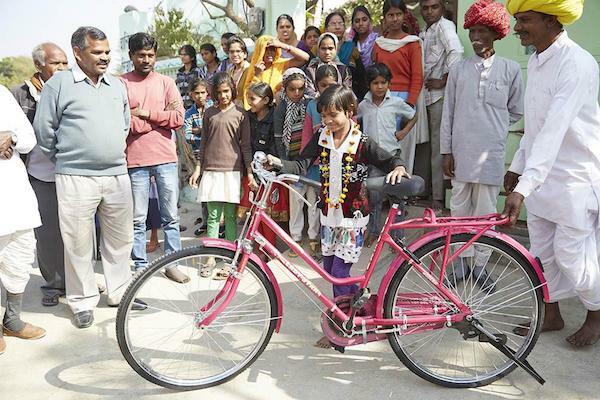 A donation for a pink bike supports schoolgirls of the Jawaja leatherworkers and weavers cooperative (AAJ – Artisan’s Alliance of Jawaja). A donation of $100 (Canadian) purchases a sturdy, well-built, bicycle for one of the female schoolchildren of the village. This lets the girls travel the long distances to get to school and they don’t have to start and end there day walking in the dark. The bicycles are pink and girls’ style and extremely sturdy so the boys of the village aren’t interested in them, otherwise the girls would never, ever get a look in! Put flour, ground almonds and sugar in a food processor and combine. Add butter and process until just crumb-like. With the machine running add yolk and 2 tbls water. Process until dough comes together. Add more water if necessary. Wrap and chill for 20 minutes. Slice butter and arrange on bottom of skillet to cover completely. Sprinkle an even layer of sugar, then almonds. Core pears, and pack into pan, curved side up. Then place on medium heat on stove and cook until butter and sugar caramelize. About 20 minutes. On a floured surface, roll out dough to cover the pan. Roll dough onto rolling pin and place on top of pears. Tuck edges of dough around pears. Poke dough with fork. Bake in preheated oven at 425 F for 20 minutes or until golden. Remove from oven and let cool for 5 minutes. Run a knife around edge of pan. Place a large plate over pan and invert. Serve warm or at room temperature. With my apologies to all you metric bunnies.